Join the discussion on our forums! Come discuss Commander Rhyssa over in our dedicated Commander Rhyssa discussion topic. 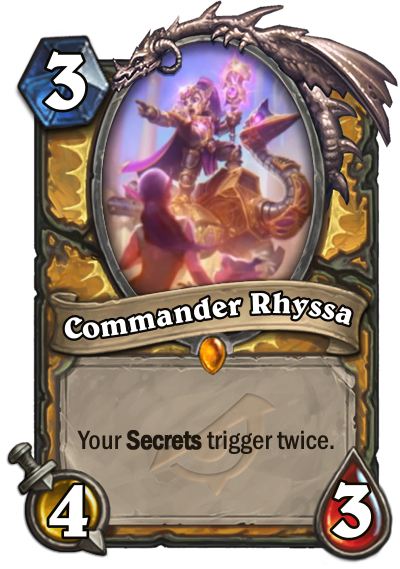 Is Rhyssa a gnome paladin? ? I wonder how it works with rogue, mage and hunter secrets. You can hear Mysterious Challenger busting a massive nut all the way from Standard. Repentence twice useless, Redemption twice underwhelming, Autodefense Matrix useless, Noble Sac twice totally underwhelming, Never Surrender twice pretty good but basically win more, Eye For An Eye twice is just bad. Does it mean you basically have two seperate triggers? So will two enemy minions get repentance or is it twice on the same? Because that would be good. But if my assumption is correct, this is utter trash in standard. Well an ok card for secret paladin if deck sees play. Any idea how it interacts with some secrets? both "get down" will be attacked by the same minion even if it died from the first? No, it'll summon two and only one will be attacked. Competitive Spirit will trigger twice, Avenge, so forth. Only questionable ones will be 'Sacred Trial', which would likely just not do anything extra at all, Repentance, which will set it to 1 twice, thus also not doing anything, and the big question is whether Autodefense Matrix will give divine shield twice before the minion is attacked or once before and after, though knowing Blizzard, I'd assume the former. Redemption and Getaway Kodo will seemingly give you two copies of the destroyed minion even if they say 'return the minion', since they summon copies of said minion instead of literally returning it. I personally think they didn't really put much thought into this card as far as some of its interactions go, maybe they wanted to rush it out for one reason or another.